What are these music pages about? 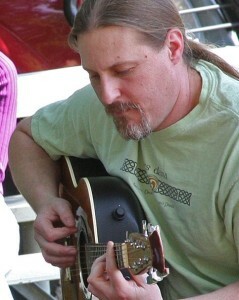 I've been playing and recording my own music since the early 1980s. As a dedicated amateur you can't expect high quality recording or musicianship, but I've had a lot of fun over the years playing with friends in various groups. I tasted the bar scene a little bit and didn't like it, I'm much happier to get together at house parties or events to entertain. Most of my early music experiences were classical (on 'Cello) or for musicals. I got into heavier stuff when I took up the bass, and later the guitar. My current love for folk, Irish, and ancient music only developed slowly since the late 80s but I also carry along a fiddle these days. 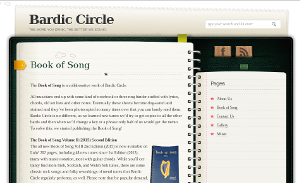 The most recent group I recorded and played with is Bardic Circle which is an Irish folk group. 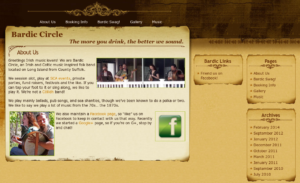 We've got a facebook page, and G+ page but the bardiccircle.info web domain expired and we didn't renew it. The screenshot below is all that remains. My tape collection of recorded stuff is quite large, though most of it is crap, frankly. As I would get together with folks over the years I've always tried to make a point of recording some of what we were doing because those magical times with different folks never last as long as we all would like. Usually when things start to fall apart its too late to get anything recorded! I would gather a bunch of tunes together at some point and create an album which I would "release" in the spirit of the mixed tapes of the 80s to everyone who had been involved and any friends that were interested. This practice started with tapes, shifted to CDs, and more recently has been a bunch of digital audio files. I've added some pages for the various silly projects like this I've worked on over the years which are listed here.